Berlin (dpa) - Garlic can ward off vampires, according to an old superstition. Modern science also ascribes protective powers to the pungent bulb -- against health problems. "Garlic was cited as a remedy in ancient Egyptian writings as far back as 1550 BC, and it's regarded to this day as a prophylactic agent and remedy for many illnesses," noted Margret Morlo, a member of Germany's Nutrition and Dietetics Association. Garlic owes its medicinal powers to its components. It contains many vitamins and minerals, including vitamins A, B and C as well as potassium and selenium. It also has a number of beneficial phytochemicals, such as polyphenols and sulfides, and a comparatively high content of adenosine, a biochemical compound important for cell metabolism. "Since garlic is usually consumed in small amounts, not all of its health-promoting components carry weight," remarked Stefan Weigt, a member of Germany's Independent Health Advice Association. So it is with its vitamins and minerals, he said. 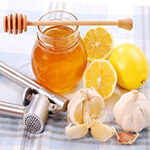 To meet the daily requirement of vitamin C, for instance, a person would have to consume nearly 800 grams of garlic. "It's a totally different matter as regards phytochemicals, though. Here the bulb is really outstanding -- especially with sulphides," Weigt said. Sulphides are sulphur-containing compounds that "can have a beneficial effect on health in many ways. They're antimicrobial and anti-inflammatory" and thus help to guard against or fight infectious diseases, said Antje Gahl, a nutritionist at the German Nutrition Society. Studies by the University of Arizona in the United States have shown this to be true in the case of colds. According to studies by the University of Sheffield in the United Kingdom, garlic can help prevent periodontitis and other diseases of the mucous membrane of the mouth. The sulphides in garlic have positive effects on the cardiovascular system, too. "It's been proven that they lower the levels of cholesterol and triglycerides in the blood -- blood fat levels," Morlo said. A team at the National Cardiological Research Centre in Moscow found a 7.6 per cent drop in total cholesterol in 42 test subjects after 12 weeks of garlic therapy. This means regular consumption of garlic may help prevent atherosclerosis -- a narrowing of the arteries due to a buildup of fats and cholesterol -- "and therefore cardiovascular disorders like blood clots, strokes and heart attacks," Weigt added. Some studies have not confirmed garlic's cardiovascular powers, however. "Garlic is also said to help inhibit cell damage and the development of tumour cells thanks to the antioxidant effects of its phytochemicals," Gahl noted. Antioxidants have the ability to neutralize free radicals, which are atoms or groups of atoms that attack cells and can cause them to degenerate. "There's not complete certainly on this," she pointed out. "But an analysis of animal tests and statistical surveys suggests that garlic lowers the risk of cancer." This has been virtually proven in the case of stomach and intestinal cancer, she said. To get garlic's health benefits, "it's extremely important to consume it regularly, preferably every day," Morlo said.